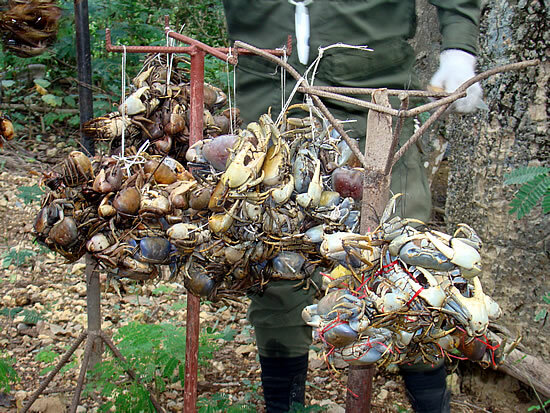 In a press release, the Martinique Regional Directorate of the Environment (DIREN) reminds the public that, due to significant amount of deaths of mantou crabs (also known as mangrove land crabs, mud crabs, or Ucides cordatus) found in April, their habitats are being monitored with the help of the Division of Veterinary Services, particularly in the areas of Sainte-Anne, François, and La Trinité. To date, analytical results of toxicology tests are not yet known. Given significant mortality rate observed in adult specimens occurring before the period of reproduction of this species, fishing of the land crabs could seriously harm the survival of the species. As a precautionary measure, a decree has been placed to prohibit fishing, trapping, transporting, purchasing, or selling these endangered crabs. The prohibition began on May 20, 2010, and will last for at least six months, after which, it may be renewed. In April rangers of the Regional Natural Park of Martinique reported anomalies in land crab populations in the mangroves and pond at the Réserve Naturelle de la Caravelle. Besides a high mortality rate, other characteristics included dangerously soft shells, disorientation, and other unusual behavior. Other areas where crabs were affected include Cap Chevalier and Génipa. These crabs have been suffering heavy losses in other areas of the Caribbean coastal areas—for example, in the Dominican Republic, Puerto Rico, and Venezuela—where short and long-terms bans on trapping them are regularly put into place to save the species. Crab mortality has often been linked to the disappearing mangroves and the use of pesticides.